Dr. Shanna L. Smith, assistant professor, in the Department of English, has been named Mississippi Humanities Council Teacher of the Year. A native of Kentucky, Smith was stunned by the news. Dr. Candis Pizzetta, interim chair of the Department of English, said that it is difficult to summarize everything that Smith has accomplished at JSU in a few short years. “She energizes students in her courses with texts that inspire and model social action for students. She has achieved national recognition for her work with students on “The Hate U Give” and is regularly invited to speak about the relationship between literature and politics,” said Pizzetta, making reference to Smith’s work that explores themes found in the book by Jackson native Angie Thomas, which follows the protagonist Starr Carter who witnesses her unarmed friend being shot and killed by a police officer. 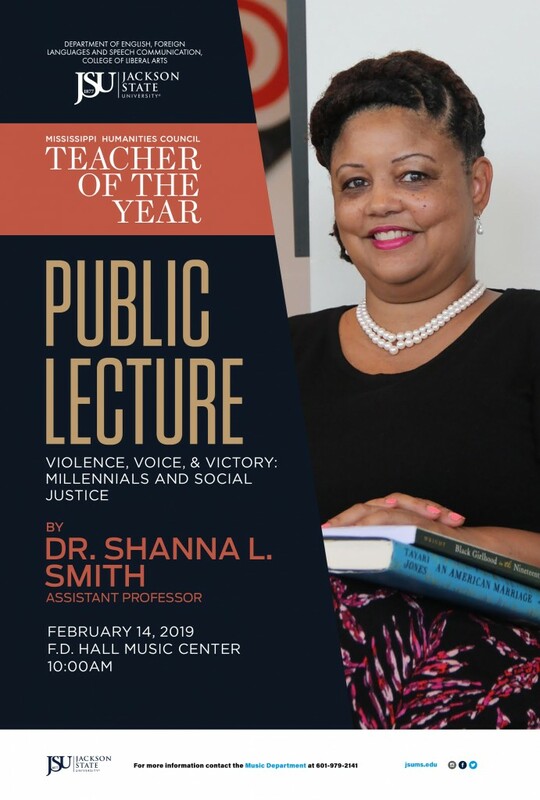 As part of her award, Smith will do a campus presentation on Feb. 14, 2019, in the F.D. Hall Music Center at 10 a.m. on Violence, Voice and Victory: Millennials and Social Justice. Recently, Smith presented at St. John Fisher College in Rochester, New York where she was asked to introduce issues around “The Hate You Give,” young adult social justice, and controversial rapper the late Tupac Shakur. Pizzetta also points out that Smith is involved in a seminal oral history project and conducting interviews with living legends among Kentucky African-American writers. The Kentucky Oral History Association has lauded the funded research as essential to building the historical archive for twentieth-century African-American writers. “We are fortunate to have her in our department, and her approach to teaching and career development demonstrate how student-centeredness can serve as the core value for faculty as both instructors and researchers,” Pizzetta said. Smith shared that she loves her students and the classes she has been able to teach. She is also grateful for the unlimited support of Jackson State University, the Department of English, Foreign Language, and Speech Communication, and her colleagues. Smith’s parents are even making the 8-hour trek to attend her presentation. “All of my opportunities, everything that has happened for me to get this award is because of the support that I receive,” she said.